Dave Andrews has mining in his blood – generations of it dating back to Welsh miners in the 1800s. 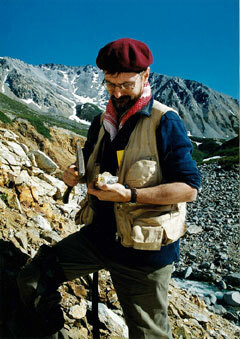 But it was a Monash University lecturer who nudged him into his first job as a geologist with Rio Tinto. Dave has worked for Rio Tinto in technical, managerial and commercial roles in 36 countries since then at often exciting times in history. He was part of the diamond rush in the late seventies in the Kimberley region, Western Australia, and saw apartheid first hand visiting South Africa. He witnessed the last days of the USSR in the early nineties when he was the manager responsible for exploration in Far East Russia. He is now chief geologist with Rio Tinto, based in Melbourne. “I think I’ve probably got the best job in the company – I enjoy it and it’s still a challenge,” he said. He devotes his time outside work and the travel it involves, to his family. Another piece of advice is that mining is cyclical so treat it as a career rather than a job. As an alumnus, Dave is helping a future generation of miners by contributing his thoughts on what a geoscience course should offer and providing links with others in the industry.